The Lena Rectangular Ottoman adds appeal to any interior. Multi-functional. Stylish. It's the perfect addition to a bedroom or living room. Made by generational craftsmen, for quality that lasts. Shop the rest of the Lena Collection. 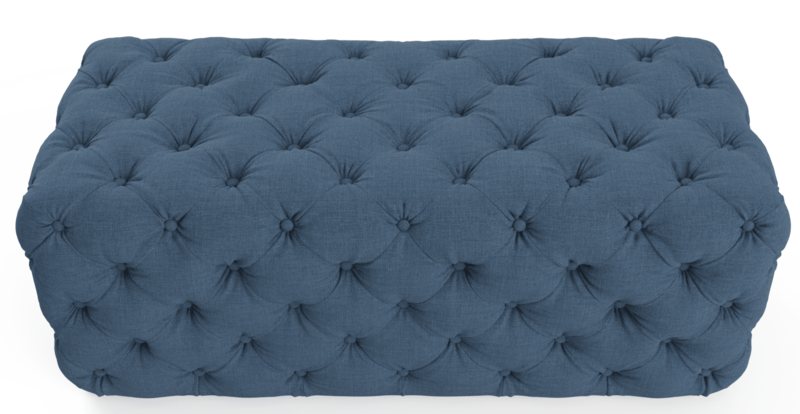 Beautiful tufted detailing adorns the Lena. It comes in a wide variety of dark or light shades. Select from our soft yet durable Signature Premium fabric, or luxuriously soft Warwick Mystere velvet. The Lena has a lush foam filling. All materials were selectively sourced for their premium quality. Soft rounded edges make it ultra-comfortable as a seat or footrest. We also suggest adding a tray on top, to create a more solid surface. The frame of the Lena Rectangular Ottoman is made from Solid Wood. Concealed plastic legs have been fitted, to prevent movement and increase stability. Shop a wider range of ottomans available in every style. Styles, quality of furniture, ease of purchase and delivery. I have ordered many items through BROSA and love the quality, styles and delivery. I tell all my friends and colleagues about how you are. I love all my purchases and customer service is amazing. See, touch and feel our fabrics used on our Lena Rectangular Ottoman. For Free! Simply select up to 3 fabrics and add them to your cart. Delivery is on us.